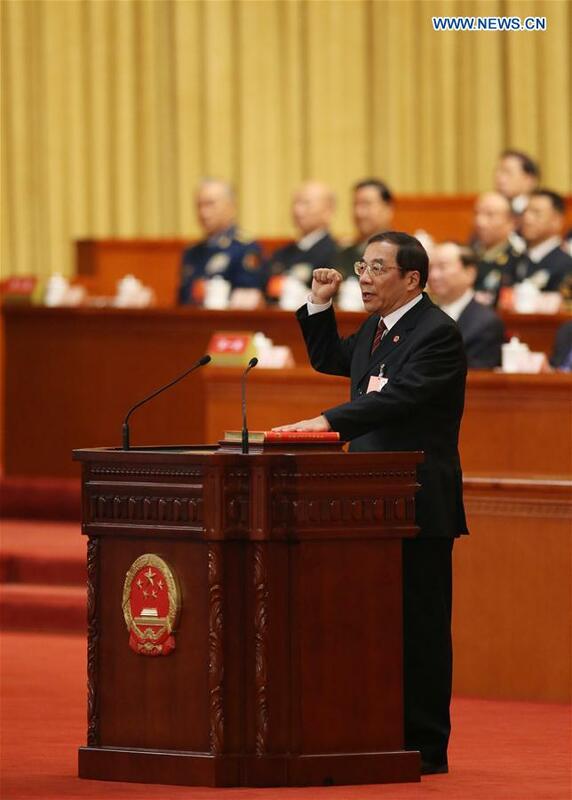 BEIJING, March 18 (Xinhua) -- Yang Xiaodu was elected director of the national supervisory commission Sunday morning at the ongoing first session of the 13th National People's Congress. Yang, born in 1953, is currently a member of the Communist Party of China (CPC) Central Committee Political Bureau and deputy secretary of the CPC Central Commission for Discipline Inspection (CCDI). He is the first director of the national supervisory commission, the national agency of a new anti-graft and supervisory network that was endorsed by the constitutional amendment about a week ago. The revised Constitution, adopted by the 13th NPC on March 11, first listed supervisory commissions as a new type of state organ. As the supreme supervisory organ, the national supervisory commission oversees local commissions, which have a similar setup. Yang's taking office marks a vital step for the country's sweeping reform of supervisory system. A pilot reform program began in Beijing, Shanxi and Zhejiang in December 2016 and expanded nationwide in November 2017. Yang had headed the Ministry of Supervision and the National Bureau of Corruption Prevention until an institutional restructuring plan of the State Council, adopted Saturday, decided to merge the two agencies into the national supervisory commission.